This article is about the race course from Mario Kart: Double Dash!!. For Rainbow Road as a whole and other versions of the track, see Rainbow Road. Rainbow Road is the final race course of Mario Kart: Double Dash! !, in the Special Cup and All-Cup Tour. Its staff ghost is Mario and Peach in the Red Fire. This is the second Rainbow Road to include Dash Panels, the first being the Mario Kart: Super Circuit rendition, and the first to feature rails in only in certain parts of the course. It features a helix and a large pipe that launch drivers to the highest point of the track after reaching the very bottom (a possible precursor to the Launch Star featured in later Rainbow Roads). 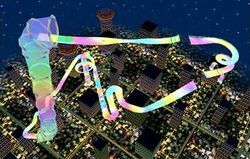 It also contains giant rainbow floating sculptures of items, and rains stars that racers can pick up. 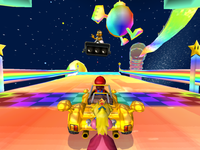 Depending if the mode is in split-screen or not, Rainbow Road takes place either over a city or in deep space. The city located below the course could be Mushroom City, according to the design of some of the buildings. Although there are no visible clouds in the sky, their reflections can be seen on the track surface. The track begins just before a ramp with a boost panel on it, which sends the player flying into a somewhat straight, downhill section of a track. This part of the track tends to be very bumpy and causes Shells and Eggs to bounce around, which hinders their homing skills. After a slight curve to the right and a straight road, there is a sharp pair of switchbacks, which is followed by a boost ramp that sends the player flying. The ramp actually leads to a road lower than the previous, both with lengthy boost panels on a straight road that leads the player into a helix with boost panels on it. The helix spirals upwards to the left. Boost Panels and Item Boxes are present in this helix. The boost panels can help the player speed up, or help the player plummet to their doom until Lakitu saves them. Past the long helix is a bump road that is straight, but then waves near the end of the long straight road. The road is also very bumpy here and shooting stars hit here and become Stars for the player to play around with and mess up the other racer's progress by knocking them over the cliff. Past the wavy road is a curve to the left and a pipe. Any item thrown in the pipe gets destroyed and players are invincible when blasted up the pipe. At the end of the pipe, the player falls down and hits another boost. The boost sends the player into a long road, also with a lot of small boosts that can help or hinder the player. Stars can also spawn here. After this straight road is a ramp with boost panels on it, and it leads the player to a downwards helix. The downwards helix is sharper and shorter than the previous one, and it leads the player into the finish line again, which starts the cycle again and another lap. Rainbow Road and Baby Park are the only courses in Mario Kart: Double Dash!! to have no obstacles, excluding the Roller Coaster in Baby Park itself, which does not appear often enough to count as an obstacle. The official website claims that Rainbow Road is the longest course in the game; this is false, as Wario Colosseum is longer. However, Rainbow Road is a 3-lap track, so it does take longer to finish than Wario Colosseum, which is a 2-lap track. When playing in split-screen mode, the city and the item sculptures are removed. This is the first Rainbow Road to have a "glistening" sound effect when a racer is drifting or making a sharp turn. This has become a common feature in subsequent versions of the track, including the remakes. This course's staff ghost is the only one which is not played as one of the default teams, as Mario and Peach are used. The music for the Rainbow Road course is available in Super Smash Bros. Brawl, Super Smash Bros. for Wii U and Super Smash Bros. Ultimate as an alternative music theme for the Mario Circuit stage. The final part of the music is an arrangement of part of Rainbow Road's theme from Mario Kart 64. This page was last edited on March 6, 2019, at 17:06.